When Charles Darwin wrote On the Origin of Species, he and most paleontologists believed that the oldest animal fossils were the trilobites and brachiopods of the Cambrian Period, now known to be about 540 million years old. Many paleontologists believed that simpler forms of life must have existed before this but that they left no fossils. A few believed that the Cambrian fossils represented the moment of God's creation of animals, or the first deposits laid down by the biblical flood. Darwin wrote, "the difficulty of assigning any good reason for the absence of vast piles of strata rich in fossils beneath the Cambrian system is very great," yet he expressed hope that such fossils would be found, noting that "only a small portion of the world is known with accuracy." Since Darwin's time, the fossil history of life on Earth has been pushed back to 3.5 billion years before the present. Most of these fossils are microscopic bacteria and algae. However, in the latest Proterozoic  a time period now called the Ediacaran, or the Vendian, and lasting from about 635 to 542 million years ago*  macroscopic fossils of soft-bodied organisms can be found in a few localities around the world, confirming Darwin's expectations. What was life like 560 million years ago? Bacteria and green algae were common in the seas, as were the enigmatic acritarchs, planktonic single-celled algae of uncertain affinity. 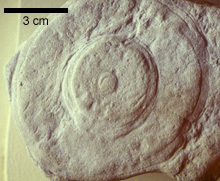 But the Ediacaran also marks the first appearance of a group of large fossils collectively known as the "Ediacara biota." The question of what these fossils are is still not settled to everyone's satisfaction; at various times they have been considered algae, lichens, giant protozoans, or even a separate kingdom of life unrelated to anything living today. Some of these fossils are simple blobs that are hard to interpret and could represent almost anything. Some are most like cnidarians, worms, or soft-bodied relatives of the arthropods. Others are less easy to interpret and may belong to extinct phyla. But besides the fossils of soft bodies, Ediacaran rocks contain trace fossils, probably made by wormlike animals slithering over mud. The Ediacaran rocks thus give us a good look at the first animals to live on Earth. Three of the many interesting Ediacaran fossil animals. 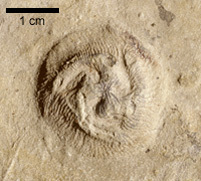 From the left are Tribrachidium, Cyclomedusa, and Dickinsonia. The Ediacaran is the youngest period of three that make up the Neoproterozoic Era, which in turn is the youngest of three eras within the Proterozoic Eon. The Ediacaran is sandwiched between the older Cryogenian Period and the younger Cambrian Period. Many paleontologists held little hope that fossils would ever be found in rocks so ancient as the Ediacaran. It is now known that rock layers may be deeply buried, twisted, folded and melted by geologic forces. It is easy to see that such changes to rock would destroy any fossils that might otherwise have been preserved. Older layers of rock, which have been around for a longer time, are more likely to have undergone such changes, and are thus less likely to preserve fossils. 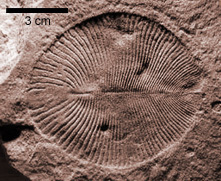 With no known fossils from the Ediacaran little more could be said, but in the late 1900s macroscopic fossils of soft-bodied animals, algae, and fossil bacteria were found in these older rocks in a few localities around the world. With the discovery of these earliest fossils came a surge of interest in the Ediacaran and the Proterozoic Era that continues today. Ediacara Hills: Fossils of some of the oldest known animals were discovered at this Australian locality in 1946. Mistaken Point, Newfoundland: Mysterious fossils from the coast of Newfoundland. White Sea: Located on the northern coast of Russia, this has been a site of active research by UCMP into the Edicaran fauna. See Ben Waggoner's exhibit on Ediacaran (Vendian) animals. See the Wikipedia pages on the Ediacaran Period and Ediacaran biota.